In person, the Sydney Opera House is exactly what you’d expect, at least on the outside. It is imposing, majestic, and unique – truly a Wonder. The gleaming white smooth curves evoke a sense of adventure sailing on the seas, and its placement overlooking the Sydney Harbor further emphasizes this sensation. The nautical theme was no accident either. The building’s designer, Jørn Utzon, was specifically inspired by his father’s work and the naval architecture of his homeland back in Denmark. Utzon was relatively unknown in 1956 when the premier of New South Wales announced an international design competition for an opera house to be built in Sydney Harbor. Utzon’s entry, number 218, was originally discarded until an American architect saw its potential and convinced the other judges. This was the beginning of a major headache for Sydney. The winning design was beautiful, but also almost impossible to build. Even the opera house as we know it today isn’t exactly like the drawings submitted by Utzon. In his imagination, the sails of the opera house were high and billowing. The concert halls were open to the air. His drawings depict people wandering up and down the stairs, walking under giant smooth, white structures balanced on long, thin legs. The underside was plated in gold. It turns out that building a structure like that, and making it a functioning opera house, is more difficult than anyone imagined. The original plan for the construction budgeted 3 years and $7 million. It ended up taking 16 years and $102 million to construct this wonder. In Civilization V, the Sydney Opera House requires 1250 construction points to build, more than most other buildings although not more than other wonders for its time period. 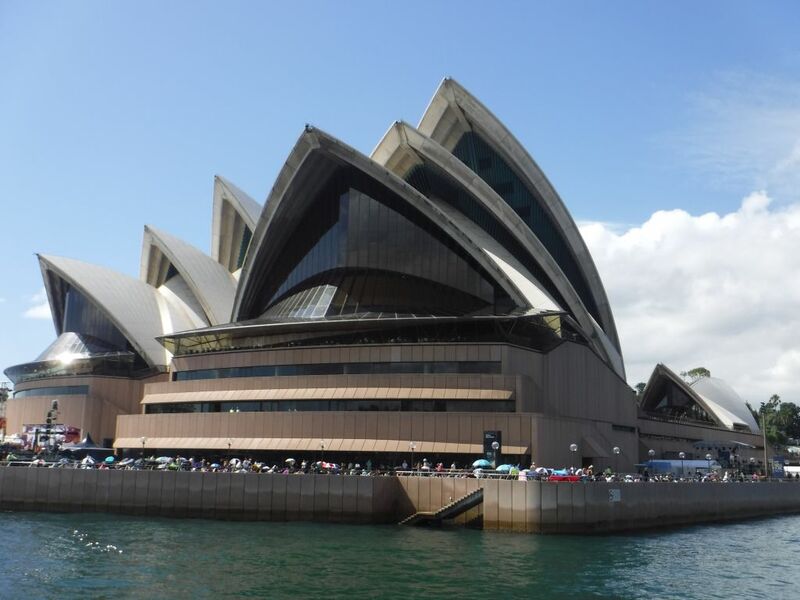 In the end, the opera house was comprised of three buildings that form the iconic silhouette. Each of these buildings are more like giant pavilions and house a completely separate interior building for the concert hall. Unfortunately, the beauty is only skin deep. We found the interior to be bland and dated, not timeless and inspired like the exterior. But this is somewhat understandable upon examination of the history of the construction of the buildings. Utzon only worked on the exterior structure. After years of delays, exploding budgets, and a change in government Utzon was dismissed as lead architect. The interior buildings were done by another firm interpreting Utzon’s designs. Today it is estimated that 4 million people visit the opera house and 1.5 million of them see one of the 2500 shows held each year, including ballets, operas, and concerts. Since its opening in 1973 the opera house has held over 100,000 shows and had over 45 million visitors. The opera house has made Sydney a cultural destination for people around the world, but most people honestly aren’t visiting for the sake of the opera. They are visiting for the building, and are willing to see an opera because it is in such an iconic building. We visited the opera house twice. Our first visit was a bit unplanned. We had just finished walking about the Royal Botanical Gardens after our walking tour of Sydney and thought that since we were right there we might as well wander over. We tried to buy tickets to a show so that we could experience the acoustics of the theatres but unfortunately all the tickets within our budget (ie less than $100) were sold out. If you do plan to visit Sydney and see the opera house we suggest that you not visit during the busiest time of the year like we did. Also, you should probably book show tickets online beforehand. Tickets can be as low as $40 and the theatres are designed so that the sound is great in any seat, though the view is a different matter. Even though we couldn’t get show tickets we were able to purchase tickets for a walking tour without problems. Tours run every 15 minutes, last an hour, and cost $37. If you do wait to book everything in person keep a lookout for coupons in city tourism pamphlets. We were interested to learn that many Australians consider Melbourne the cultural capital of Australia and the two cities have a bit of a rivalry over this, which has led Sydney to have numerous large festivals (NYE, Australia Day, etc). While in game mechanics it may have been better to build the opera house in Melbourne in order to maximize culture, its placement in Sydney is actually the more historically significant. The aborigines used the area on Bennelong Point as a meeting ground for centuries. The Sydney Opera House does boost the culture of the city, perhaps by 50% as the game benefits offer, but not in the way one would expect. It really has more to do with the magnificent structure than with anything that is going on inside the building. The operas don’t boost this city’s culture, the building does.